When: Saturday, April 6, 2019. *Bike Show opens at Noon. Banquet begins at 6:30 p.m. Directions: Exit off I-405 at Carson Street and go west. The Carson Center shares the same parking lot with the Carson Doubletree Hotel (which is visible from the freeway). The banquet is currently sold out. To add your name to the waiting list, please send email to Bill Cooper at: mrbill@vleinc.com or Don Emde at: don@emdebooks.com and indicate how many seats you are requesting. Even though tickets could be printed on the Event Brite website, their only useful purpose is for proof of purchase. All attendees must still check-in and pick up a Pit Pass. It will have your name and table number printed on it and must be worn at all times. 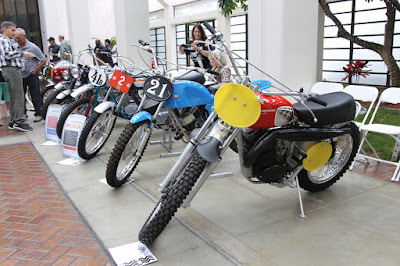 Check-in begins at Noon, except for Bike Show entrants who can check-in beginning at 10:00 a.m.
We are reserving table numbers only, not using the seat numbers generated by Event Brite. To save time, please make sure we have the name of your guests 30 days in advance so we can have them printed with their names and they can be picked up by them at Will Call. Otherwise, any un-named persons on your guest list will be given GUEST passes and will be in your envelope when you check-in. Send all attendee names and email addresses (if available) to: don@emdebooks.com. In addition to saving time at check-in, every attendee that we have names and email addresses will be added as a member and receive the Trailblazers e-newsletter for one year. By popular demand, this year’s bike show that precedes the banquet will open three hours earlier. Bike show entrants can check-in beginning at 10 a.m., Gates open at Noon and Judging begins at 2 p.m. Space will be limited, so get there early if you are bringing a motorcycle to show. First come, first served. Also, please note, because space is at such a premium, the show is for your motorcycles only. To save time, an information placard can be downloaded HERE that you can fill out and bring, or one will be provided when you arrive. No additional material can be displayed with the motorcycles. We appreciate your cooperation. Bike Show Awards: Best of Show, Trailblazers Spirit Award, Tom White Competition Award, People’s Choice. The banquet hall doors open at 5:00 p.m. with the program beginning at 6:30. For your friends and family who are not attending, the banquet will again be on Facebook Live on the Trailblazers Motorcycle Club page beginning at 6:30. Look for link to Live Video. It will cut off at 7:00 p.m. and resume after dinner at 8:00.